“I have the best review for you today. Have you ever heard of Mommy’s Sippy Cup? This awesome little cup is the brainchild of an awesome mother who never gave up on her dreams: Sharon, who blogs at Mom At Last! Though the cup itself presents as sort of a novelty, it’s completely functional, boasts no spills, and it’s BPA Free to boot! 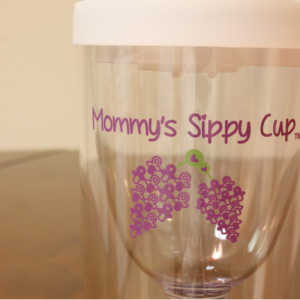 It is a wine glass encased in a plastic tumbler – great for on-the-go moms! 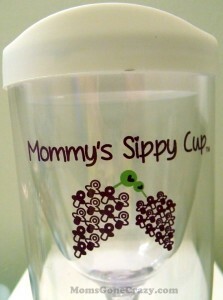 What is the BEST PART ABOUT THE MOMMY’S SIPPY CUP?!? !